If it wasn’t for the TAC, Angy Peter would never have started taking ARVs. When the fight against HIV/AIDS started, there were two teams: the believers and the non-believers. At the time, our president, Thabo Mbeki, and Minister of Health Dr Manto Shabalala Msimang were non-believers. They told many South Africans that HIV/AIDS was not a real thing and, unfortunately, many of them, like Angy, believed them. ‘I didn’t have time for ARVs. The minister was telling us that we just needed to eat beetroot and vegetables; this was someone who was educated, of course I listened to her,’ she says. Angy was halfway there: she went to the clinic regularly for checkups but always returned home to her two litres of maas and garlic mix, which she kept in the fridge. 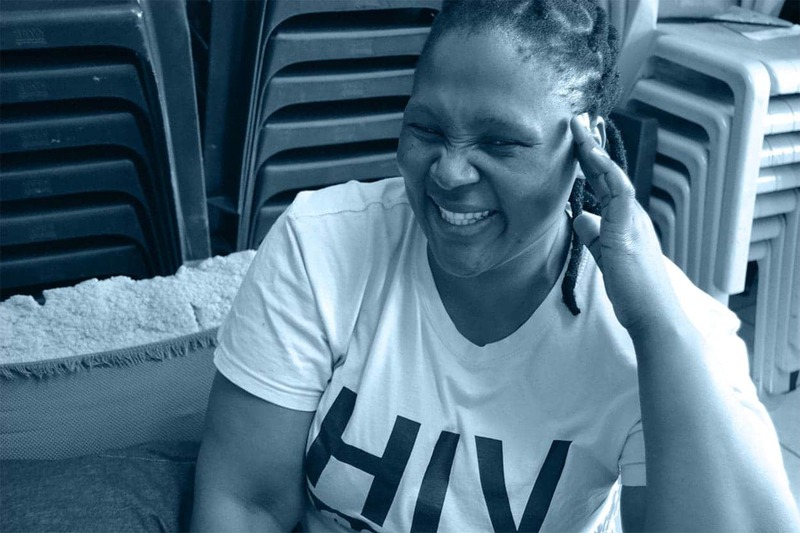 She had accepted her status, but she was not going to take ARVs. Angy Peter (above) shares a lighter moment while telling of her experiences with the TAC and below in one of the TAC T-shirts. Angy first encountered the TAC when she was sitting at the clinic. ‘I remember I was patient number 15 and there was this lady who was speaking about HIV, and I was interested because I wanted to know more.’ Her first impression of this woman was that she was incredibly smart and obviously had to be someone very important to be able to stand up in front of group of people and speak so frankly and accurately about HIV. Angy enjoyed attending support groups, she never missed a single session. But when the question of ARVs came up, she would just glaze over the topic. She had her garlic mix and she was making a memory box of her life. In her mind, she was set, there wasn’t anything else that she needed. These conversations and her exposure to treatment literacy were eventually enough to convince Angy. She joined the believers and traded in her garlic mix for ARV treatment. Ten years later, she is a staff member at the TAC, preaching the gospel of ARVs to hundreds of people everyday. Angy still remembers the first march she attended. 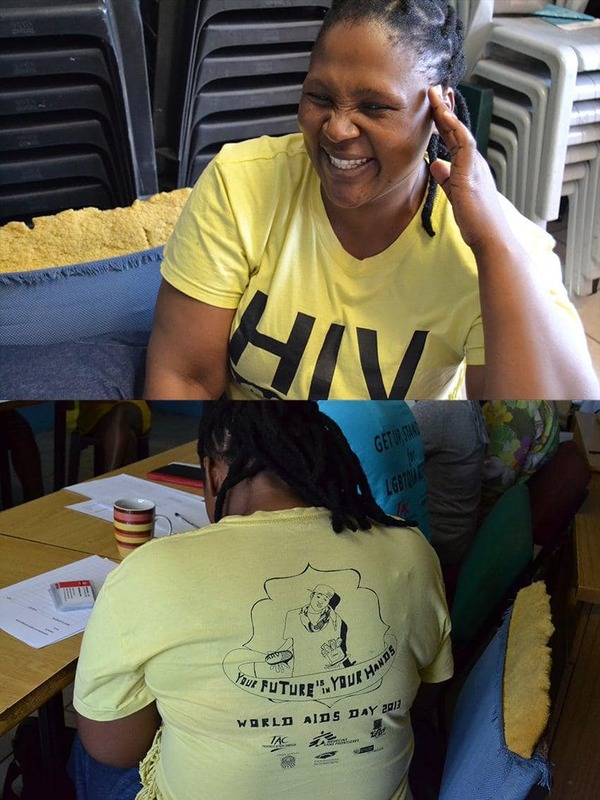 ‘I was wearing the red HIV T-shirt and it was the biggest march I had ever seen,’ she says. On that day Angy also discovered that normal working hours were not a thing. Whenever there was an emergency, the TAC had to be there. Towards the end of their march, they heard that xenophobic attacks had broken out and that hundreds of foreign nationals were being displaced. The TAC ended the march and headed straight to a community hall, where they jumped right in to feed the displaced and ensure that they had a place to sleep. ‘That was when I realised that money was no more important than a person’s life,’ she says. Angy was earning a stipend of R800. It was not much but that didn’t matter to her: she was making a difference to people’s lives, she had a passion for it, and that was what mattered the most. Over the years, Angy has come to appreciate the transparency and honesty of leadership within the organisation. She recalls a day when they received some money from a donor. She and a colleague were called to the boardroom and had an open discussion about where the money came from and what was going to be done with it. ‘That was the first time I ever saw money handled transparently,’ she said. Angy also enjoys the fact that she is free to go about her work without being constantly monitored. The openness allows people to work to their fullest capabilities; the staff come to work, because they want to be there.